Far More Than Rubies: Happy Twelve Months, Grace! I'm WAY behind on posting this! Grace is well into her twelfth month and changing more and more every day. This is my last monthly update for her though, so I want to remember all that happened during her 12th month! Clothes: Grace went through this set of clothing pretty quickly (6-9 months) After just a month and a half in this size, we started having a hard time getting things over her big ol' noggin. I held off until after her first birthday before switching to a combination of 6-9 months and 9-12 months clothing, but her dress for her first birthday party was in 9-12 months, so she was wearing the next size up before she was one, technically. Food: Nothing much changed this month. Grace drank 3 eight ounce bottles for breakfast, lunch, and dinner. She ate an applesauce or a plain yogurt with some crackers for "lunch," at daycare in the morning, and whatever we fed her (pancakes, cheese, eggs, carrots, cucumbers, potatoes, squash,) for dinner, before her bedtime bottle. Sleep: Grace slept 7 pm until 7 am with a 2 hour nap in the afternoons. We're not really sure how much she sleeps at daycare for a nap, but I'm guessing only 15 to 30 minutes. Activity: Grace has loved using a walker that our friends gave her. She has gotten really good at cruising around on furniture and loves to pull up on my pant legs and explores every nook and cranny of our apartment. We were able to spend more time outdoors this month and Grace loves to be in the water at any chance. Personality: Grace has become such a happy baby. If we thought she was a happy baby before, she is twice as happy now! Once she wakes up, she is all smiles, loves to point at things, and will dance away to music as it plays. Likes: Grace loves her "happy bunny," that sings a song. This month has been a fun one, as you have learned so much and become cuddlier. I always wanted a child that cuddled since that is my love language. You love to sit with us, facing us, and lay your head on our chest, and smile! I can't wait to see how you bloom into your very own personality over the next year. You are so sweet and spunky, funny and charming. I love you with all of my heart. 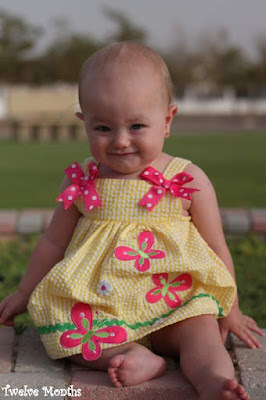 She is beautiful and I love her dress in the picture, so cute! Love her picture!!! That dress is beautiful! It crazy how fast this year went! It's amazing how fast a year goes by?? ?